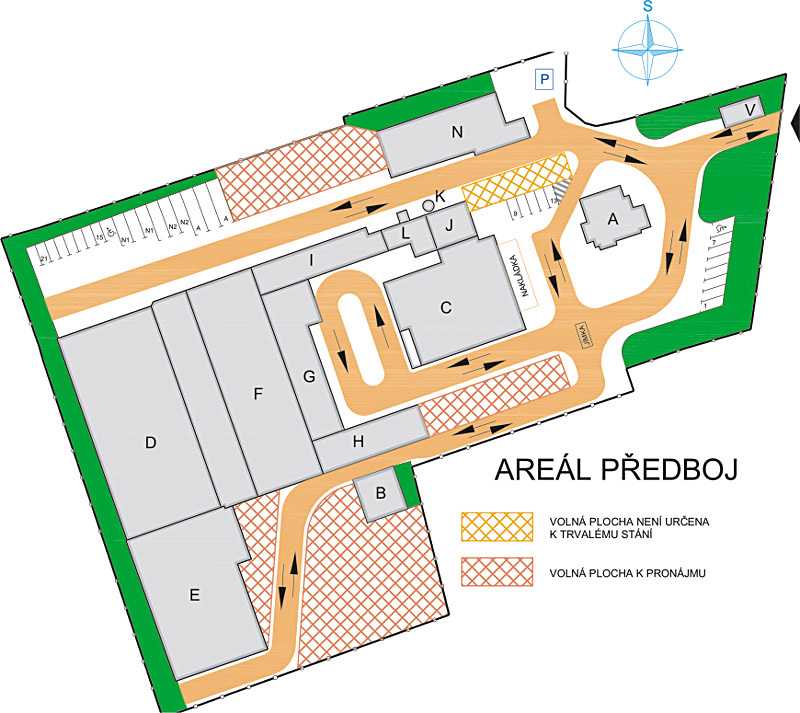 Předboj logistics complex is situated in the commercial zone of the municipality of Předboj, approx. 13 km from Prague, right by Expressway No. 1/9 towards Mělník. Exit motorway D8 approx. 7 km. Access for personal and cargo transport. The storage areas are part of a closed, fenced-off complex with physical night security service, TIR parking on open hard surface. Inter-connected, separable storage areas in ground-floor, walled, partialy heated, tempered building. Hall D has an open layout comprising 2 hall covering a total area of 964 m² with a usable height of 5 m. Premises accessed by 2 cargo drive-through gates 3x4 m in size. Concrete floors, no load restrictions, treated with protective anti-dust coating and in one half with a protective layer of smooth plastic cement. Strip lighting and natural light through windows, with basic office annex with sanitary facilities, shower and cloakroom in both independently separable parts, in Hall D and in Hall E. By the entrance gates in Hall D there is also a wash box and washbasin. Hall D is connected to adjacent independetly separable Hall E via 3 barrier-free steel gates 2x2 m in size. Local, electrical heating - Sahara, From 1.9. 2008 distrct hot-water heating. Hall E is a twin-nave hall covering a total area of 784 m², with an extension with 2 rooms, total area 115 m² with a usable height of 5,4 m in the main part and 4,8 m in the extension. Premisses accessed either through passages from Hall D or independently from south through entrance gates 3x3,5 m in size. Floor made of smooth concrete tiles. Offices and sanitary facilities available in admin. building of complex. Premises may be partitioned with prior consent of owner. 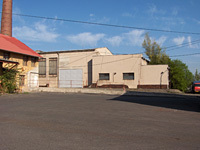 These are partitioned premises on the ground floor, brick walled, uninsulated, unheated, total hall area 1 600 m². Unsable height 3 m. Premises accessed by 2 cargo drive-through gates 3x4 min size. Poured conctrete floors, no load restriction, floor covered with concrete paving in places. Lighting by electrical discharge lamps. No heating. Offices, sanitary facilities available in complex. Premises can be further partitioned into storage cubicles measuring 2 x 300 m², 470 m², 600 m², 150 m². Approx. 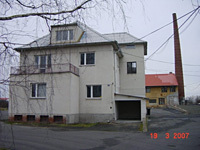 450 m² in 2 buildings (3-storey building 300 m² , 2-storey building approx. 150 m²). Walled, heated, refurbished premises with basement, interiors have beenn completely reconstructed. Hight standart. Unsable height 2,5 m. Premises accessible through entrance from complex, access to independently separable floors in both buildings via a central staircase. Concrete floors covered with heavy-duty carpet. Strip lighting and natural light trough windows. Electric central heating, from 1.9. 2008 district hot-water heating. Sanitary facilities and kitchenette available on each floor in both buildings. Premises may be partitioned with prior consent of owner only along floors of each individual building.